Heather, here. One thing you need to know about The Scottie House is that it is filled with many, winding stairs. Beautiful to the eye, but dangerous to the paw. That's why Scottie Mom put up gates where appropriate to protect Mr. K and me from slipping and falling. I must admit, I got the hang of them pretty quickly. I can only recall a few times when we first moved where I was hesitant and slipped up a bit. Mr. K, on the other hand, is so busy zoomie-ing and chasing after Scottie Mom all the time that he forgets to jump high enough half the time and ends up belly flopping on the stairs. Silly! Aside from that, neither myself or Mr. K have taken a fall down the stairs. We Scotties are pretty good at mastering the stairs. Scottie Mom has told us countless times how proud she is of us! This morning, I had a very telling "watch and learn" moment. You see, for as many times as Scottie Mom has warned Mr. K and me to "Be Careful!" 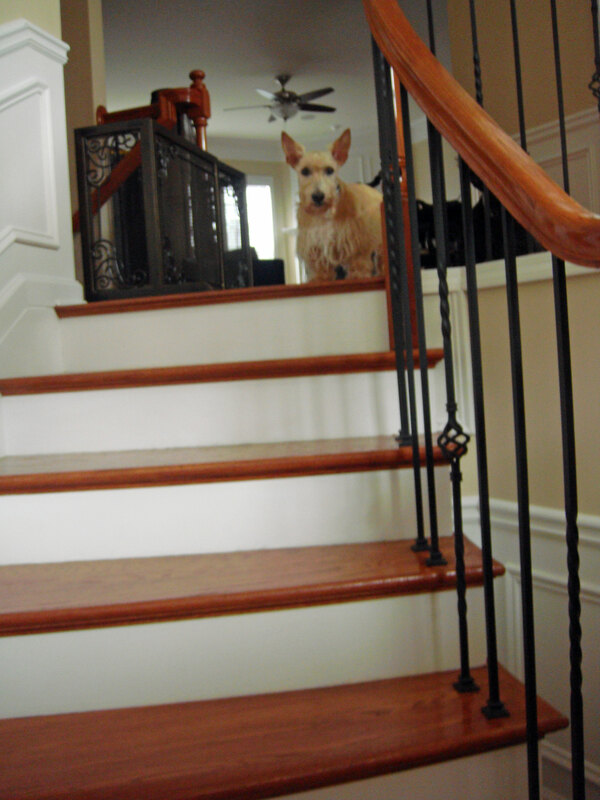 when we take the stairs, I saw first-hand that it isn't always the Scottie that slips up on the stairs. 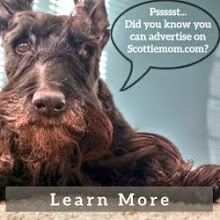 In fact, sometimes it is the oh-so-careful Scottie Mom herself! Yup...there we were, walking down the stairs ready for our morning walk. I was in front of Scottie Mom and Mr. K was lagging behind. That's when we heard, "BOOM!" and Mr. K ran off in the opposite direction. I turned around and saw Scottie Mom had sat down to hang out with me. I thought, that's nice of you, Scottie Mom, but I really have to pee. Can we play later? She had a funny looking grin on her face that didn't quite look like a smile. You know the kind. She called Mr. K back over to us, while sitting on the floor, and told him everything was okay. She hooked us up to the leash and together, Mr. K and I pulled her back to her feet. It was wonderful being able to help Scottie Mom like that. I tried my best not to drag her down the stairs outside but it was imperative I pee. Mr. K had to go, too. Hey - a Scottie's gotta do what a Scottie's gotta do. The good news is: Scottie Mom didn't injure her back again like when she did at the BlogPaws conference in D.C. (which would be really bad because Scottie Dad isn't home to help out with the walks!). The bad news is: Scottie Mom's ankle is really fat and makes her walk ten times slower on our walkies. This is especially no good when Mr. K and I find things we need to hunt! When that happens, she lets out her own sort of ArRRrOo. 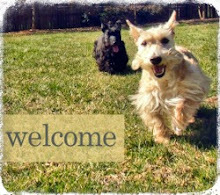 Well friends, speaking of which, it is time for Mr. K and I to round up Scottie Mom and go out for one of those walkies. If you're going out, too, be sure to tell your Scottie Moms to be careful and master the stairs (like us Scotties!). Love, Heather. Poor Scottie Mom! Hope the swelling goes down soon and that it stops hurting too. Maybe you should all camp downstairs until Scottie Dad is back home. Positive thinking coming your way. We don't have any stairs. You should have seen me when I was five years old and had to do stairs for the first time. Then again, I'm glad there was no camera around then. Those look tricky... Good luck!